It was an unusual sight last Sunday afternoon: homeless teenagers in ragged clothes and members of Austin churches strolling down Guadalupe Street together, holding trash bags, picking up trash with their rubber gloved hands. What's going on? Community healing. At least that was the aim of organizer Terry Cole, a member of Covenant Presbyterian Church, who last year left a high-tech career to start Street Youth Ministry, which provides resources and spiritual care to Austin's street-dependent youth. Cole, who is commissioned through Covenant, organized the Reaching Out event to bridge the gap between the street youth population and the rest of the community, because he says there is animosity on both sides.“It's hard to hate somebody when you get to know them,” Cole said.“I think the event was a big success. I thought that an event where the street kids could volunteer alongside others would be win-win. We chose to clean up the area around the Drag because that is where many of the kids hang out, and there is a lot of friction between the business owners and the kids,” he said. More than a dozen church volunteers and about eight homeless youth showed up for this first event, which was sponsored by members of Pedernales River Fellowship Church, who provided supplies, food and drinks for the volunteers. Together they cleaned up 350 pounds of trash from alleys, hangout places and streets in the west campus area near the University, Guadalupe businesses, and downtown churches. Cole hopes to repeat this event monthly, with different groups or churches sponsoring. Keep Austin Beautiful also provided tools and supplies. Cole's aim for Street Youth Ministry is to see transformed lives. Through partnering with Lifeworks, a non-profit organization that provides street outreach, and also a missionary organization called Help for All Nations, Cole ministers to about 60-70 youth per week, many of whom are former foster-care recipients. 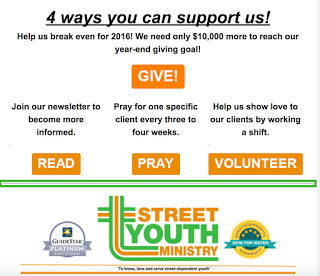 For more information about Street Youth Ministries, or to sign up to sponsor a Reaching Out event, go to StreetYouth.Blogspot.com.